"Seattle's food scene is bursting with Asian cuisine, which inspired these oh-so-savory turkey lettuce wraps. Try them tonight." Cook turkey as specified on the package. Always cook to well done, 165 degrees F as measured by a meat thermometer. Add garlic, ginger, soy sauce, brown sugar, green onions and red bell pepper. Cook 7 minutes or until garlic is soft. Remove core from head of lettuce; separate, wash and dry leaves. 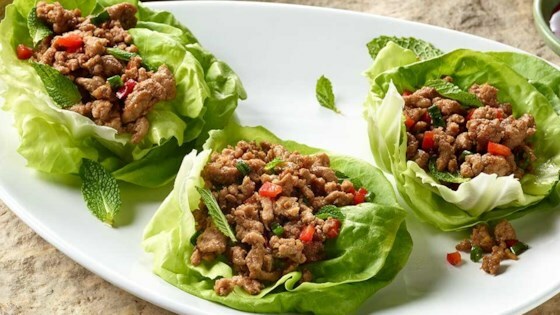 Spoon chilled turkey mixture in lettuce cups. Pretty good, but I would add tomatoes and maybe cilantro.